The subtitle “a dream trip on the beloved Vespa” gives us insight on how special the bond is between Marco and his bike. A sort of symbiosis that is usually generated between the solitary rider and the vehicle he shares its days, weeks, months… sometimes years with. The author of this book has covered 9.400 kms in only 22 days, crossing 9 countries. A real tour de force, which has taken him to reach the northeast part of Norway and of Europe. A letter written by Marco and a copy of his book made us discover that, with him… we were there too. “Dear GIVI ITALIA, I’m a 28-year-old guy, I live in the province of Venice and have an exorbitant passion for adventurous journeys. Two years ago, I was in North Cape with my Vespa using three of your GIVI bags (two side ones E21 + the top case E300), installed by me on a frame I made. I must congratulate myself with you for the great price performance: after 3 years and after 45000 kms, often in adverse climate conditions… they still look as good as new. The bags are well visible even on the cover book I sent you. I hope you’ll like that. The money made from the publication – self-produced and financed – was donated to the non-profit organisation Marco Simoncelli Fondazione onlus and to the Associazione Famiglie & Abilità onlus. You can follow my adventures on my Facebook page under “Obiettivo Capo Nord in Vespa” and “il mondo in Vespa” (the world in Vespa). The letter we received has left a mark in all of us from the “Explorer” team. We want to publicly thank Marco for sharing his appreciation, which goes beyond the usual trustworthy relationship between user and accessories’ manufacturer. It is with pleasure that we present to visitors of our portal the “Literary Struggle”. The author/protagonist He is a plumber with a passion for travels by bike, specifically by Vespa. His girlfriend even supports him in his choice “if travelling in Vespa is your biggest dream, then do it!” Marco has more than six Vespas: the travel one is the PX 125, he calls “La Poderosa” (The Powerful). As favourite readings he cites (and it was easy to guess) Giorgio Bettinelli’s trip stories, Giorgio Serafino and Giorgio Càeran. 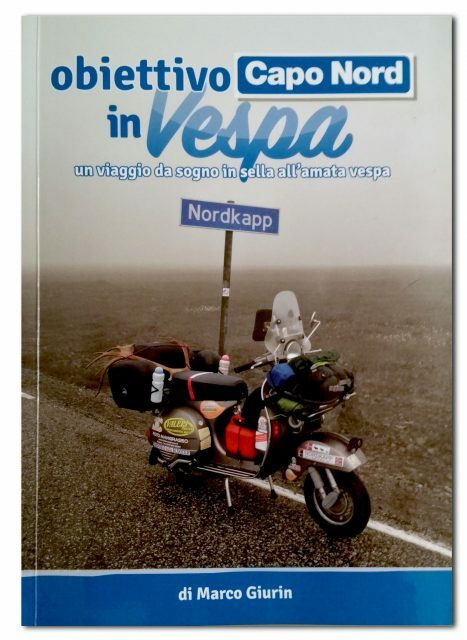 Obiettivo Capo Nord in Vespa is edited like a daily log, enriched by classical reportage-like elements. The sequence is chronological and text and pictures (which are many and all in colour) go hand in hand. 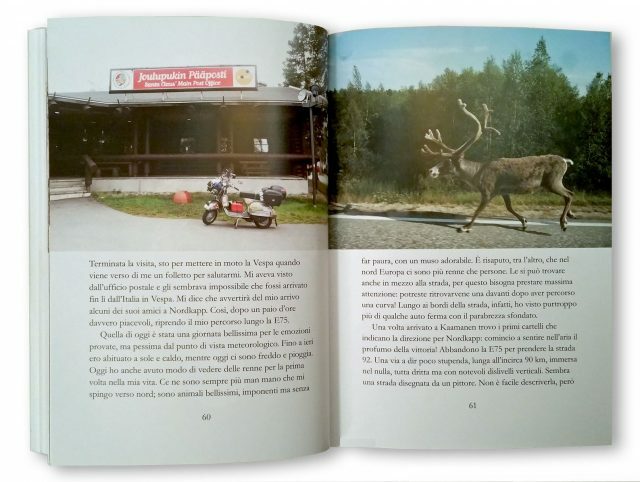 The first pages motivate the choice for the PX 125 (briefly for its engine’s reliability and for the robust bike frame) and they tell about the preparation for the journey: taking up courses in English and mechanics, planning the route, contacting non-profit associations, opening web pages and so on. Four pages are dedicated to the minute description of his personal equipment (by the way, even the full-face helmet chosen by Marco is branded GIVI), and of the preparation of bike and spare parts. The following section, the main one, opens with a map that from Mira (VENICE) shows the entire itinerary to then pass on to the diary of the 22 raid days, always with minute details and images to support it. To be able to “meet the deadline” Marco had to chew up miles every day: the shortest stop was at 200 kms, the longest stretch 700 kms. A ride test that would prove challenging even with a sport tourer with high cylinder capacity was completed with 125 cc and with 10’’ wheels! The rhythm and the photographic sequence leaves the reader with the wish to experience this journey (after all we are talking about the North Cape)… maybe with a little bit more time to breathe. The adventure is there, and Marco deserves to be ranked as one of our “travellers”. He has crossed 9 countries in solitude for many miles in the middle of nowhere; a situation that is not psychologically easy to face – as the same author recounts in the final summary – but to which you get used to. From the point of view of the vehicle the trip was perfect: no setbacks aside from three punctures. There wasn’t even need to change the spark plug. Thanks to “a good break-in, good quality engine oil and fuel/oil mixture, no engine tuning and the use of original pieces” says Marco “You will probably go slower but you get to your destination”. The last 100 kms were challenging, with a temperature close to zero, rain and fog. Having conquered all this is one of his best memories. The adventure is a state of mind and it’s not about the road you’re going down or the bike you use. It’s not something you can measure. It’s a mixture of adrenaline and fear, between courage and recklessness.